Your tour guide will be at the exit of the airpor. A paper board with your name will be held, transfer you safely to the hotel. Today, we are heading to Badaling Great Wall, one of the seven wonders all over the world. After simple lunch, pay a visit to Cloisonne Factory. Continue to Summer Palace, a world-reputed royal garden used for the royal family’s entertainment. Have a exterior visit to Bird’s Nest and Water Cube. This morning, you will visit the world’s largest urban center square, Tiananmen Square. Walk through the square to the Golden Water Bridge, you will enter the largest as well as best-preserved imperial palace complex, Forbidden City. In the afternoon, drop by tea house to learn more about tea culture. Soak in the Hutong with rickshaw, which let you know the real life of local people. Be tranferred to airport and fly to Xian. Visit Shaanxi Provincial Museum, where the best cultural heritage of Shaanxi Province is housed. Soak in City Wall, one of the largest ancient military defensive systems in the world. Pay a visit to Terracotta Warriors, one of the greatest achievements in archeology history of the 20th century. Drop by Xian Art Pottery Factory, then Big Wild Goose Pagoda is waiting for you, a symbol of the old-line Xian, a well-preserved ancient building and a holy place for Buddhists. Tour ends with Bell Tower. Be tranferred to airport and fly to Lijiang, have a lunch and visit Lijiang Ancient City, situated on the plateau of more than 2400 meters in altitude, rear in China that such well-preserved minority ancient city still exists. Morning, we are going to Wood Mansion, Lijiang’s ancient ruler Mu’s official residence. 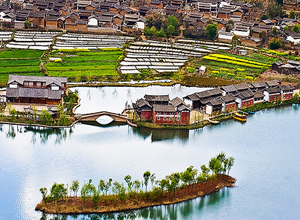 Continue visit Shuhe Naxi Village, the most charming mountain village across China. Afternoon roaming to Dongba Museum, which displays the splendid Dongba culture (Dongba is the region of Naxi people in Lijiang). Our tour start with Yak Meadow, a place where you can get relaxed and please the eyes with the breathtaking meadow scenery. Then visit Jade Dragon Snow Mountain, which is granted as the North Holy Mountain, the spiritual prop of Naxi people. Afternoon go to Black Dragon Pool, a famous Taoist temple in the Wulao Peak. Stroll through the enchanting traditional Basha Village and appreciate the Mural there, which is about 600 years old. In the morning, be transferred to airport and fly back to Kunming. Head to Stone Forest, formed by karst topography 200-300 milliom years ago. Today, be tranferred to airport and fly to Guilin, then tour to Elephant Trunk Hill, 316 million years history and holds a charming flavor in sunrise and sunset. Soak in Reed Flute Cave, known as ‘The Palace of Natural Arts. We are heading to Longsheng County, tour start with Longji Terraced Field, created by the minority peoples of the area. Then go to Zhuang and Yao Ethnic Tribes, driving back to Guilin. Today, the cruise tour on Li River will be an unforgettable experience. Roam on the exotic West street in Yangshuo, to relax in the characteristic bars or buy some interesting local things as souvenirs. Be tranferred to Guilin city. After breakfast, we are going to visit Moon Mountain, named for the conspicuous, lunar-shaped cavity in the center. The Big Banyan Tree is waiting for you, which is more than 1,000 years old. Then be tranferred to airport and fly to Shanghai. In the morning, we are heading to Yuyuan Garden, a famous classical garden in Shanghai. Then take a visit to Shanghai World Financial Center, the highest building in Shanghai. Afternoon we are going to Jade Buddha Temple, famous for the two jade Buddha statues brought from Burma. Later on move to Silk Factory to know silk culture. This morning, you will have free time before departure. Later on be transferred to airport and fly back to your hometown. *China internal flights: Beijing-Xian, Xian-Kunming, Kunming-Lijiang, Lijiang-Kunming, Kunming-Guilin, Guilin-Shanghai.